DerekJeterTrainers.com provides you with product information on top quality baseball training aids endorsed by MLB All-Star and MVP, Derek Jeter. Visit our Hurricane Hitting Machine Blog. Storm the plate with confidence. 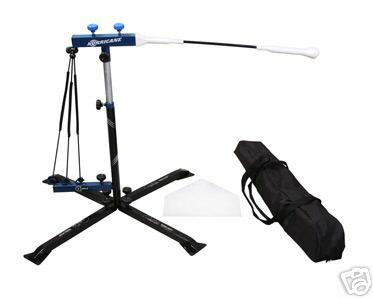 The Hurricane solo swing training machine is the ideal baseball swing trainer for batters who are serious about their games. The Hurricane has turned proven two-man target and rod training into an advanced home self trainer. The integrated ball and composite rod means you can practice alone – and no more chasing balls! Traditionally available only through teams, now the Hurricane's expert training benefits are available to you at your home or anywhere you choose to practice. Can be used for solo tee practice or as a dynamic moving target. Multi-Twist design provides immediate feedback on your swing – more revolutions means greater bat speed. Improve your bat speed and power – hit and see how far it twists. Order now and take your player's batting performance to the next level! You will be always be glad you did and your player will always thankful that you made the right decision. Soon your player will be experiencing the great hitting success that he or she deserves. Click Here and Order Now! The Hurricane is the very lastest breakthrough in baseball training machines. There is absolutely no better investment that you can make in a player's future hitting success! If you are looking for the "Edge" to give your player or team a "definite advantage" over the competition, you can stop looking! You have found it, the Derek Jeter Hurricane Baseball Hitting Machine by ProPerformance Sports! 100% Guaranteed to improve skill, batspeed, hitting confidence! It will definitely help get more basehits, hit more linedrives, score more runs and win more games! Infact we back this machine with one of the best product guarantees in the sporting goods industry. We back the Derek Jeter Hurricane Baseball Hitting Machine Machine with the ABSOLUTE BEST WARRANTIES and 100% MONEY-BACK GUARANTEES in the industry! If you have questions, we can help! We will gladly answer an questions that you might have. We want you to buy the perfect machine for your needs! Call 1-877-431-4487 now! Contents includes: Hurricane Unit with 3 power bands, Home plate and Carry bag. Use it like a stationary or moving target. "The Hurricane Training Machine's ball rotates at a high speed to give the batter practice hitting a moving ball. When the ball is hit, the ball rotates forward, slows down, and comes back to the batter for the next swing. The batter hits ball after ball without having to chase or gather balls. The machine can be used indoors or outdoors." Guaranteed to improve your batting average and slugging percentage. Endorsed by Derek Jeter! As Seen on TV! Backed by our Money-Back Guarantee!